We previously assumed the Windows Phone Marketplace submission review team had a ritual to get unbelievably intoxicated every Friday night, return back to the offices and let through whatever humorous apps they saw, regardless of functionality. We've now had to revise our assumption, as it would appear that the team is simply having some giggles behind the scene throughout the week. Introducing the app-that-shalln't-be-named (see above photo), no it's not an app dedicated to Lord Voldemort. This is possibly the most interesting submission due to the obscene graphic as the logo (we've actually censored it to keep WPCentral safe for work), which makes us wonder how on earth something this explicit can worm its way through, especially since Microsoft believes Xbox LIVE Avatar toy guns (that don't actually fire rounds or laz0rz) are offensive to the youngsters. It's perfectly fine to decapitate heads on Skyrim, shoot aliens in Halo, check out some naked women on the Windows Phone Marketplace, but a toy gun on your Avatar is deemed 'unacceptable'. 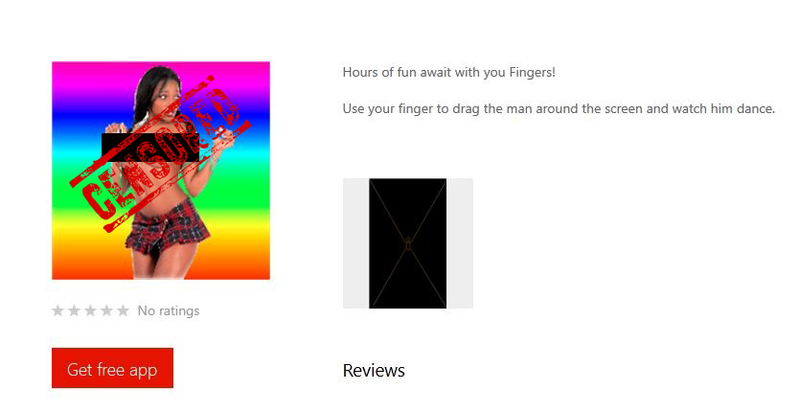 "Hours of fun await your fingers"
"While quite deceiving, the actual use for this app changed my life! Now I drink champaign and flirt with movie stars all day every day!" "This is by far the *** app I have ever. Downloaded even worse is the fact they use a *** chick to try to reel you in. Watching grass grow is more entertaining than this"
What's with this post, and why are we providing attention without firing out the Marketplace link left, right and centre? It's frustration. Pure and simple frustration. We have apps such as this making their way through while solid submissions such as the Carbon Twitter client and even our own WPCentral app had difficulties for various reasons. Not to mention Ffffound experiencing issues due to adult content policies. It makes one consider if all apps should have naked women as app logos to ensure a 100% chance of approval? We've certainly been here before, and Microsoft has even responded to our cries out for tighter control with revisions being made to the limit of apps being submitted within 24 hours, but this is starting to get slightly silly now. Either the automated system needs working on, or we need some more human verification. Thanks goes out to everyone who tipped us on this!